It’s time for a fashion post. Or at least my version of one. On the streets of Paris, my eyes are always peeled for the latest French trends. It’s a fun game to play at the school gate, at crèche pick up, on the metro or out for dinner with friends. It’s also a passive attempt at slowing a one-way skid down Dagsville (nobody French lives there); where comfort and practicality threaten to eclipse any fashion sense I’ve retained since well, B.C. (before children). Here’s what I’ve discovered. Fashion for everyday Parisians revolves around a common ‘code’ relating strictly to the current season. Of course it sounds perfectly sensible to wear winter clothing in winter, summer in summer. Duh. But problems arise when the weather revolts. What happens when a sunny day turns drizzly? You get wet. A cold snap occurs late spring? You freeze. A winters day is heavy and humid? You suffer a horrifying combination of hat-hair AND frizz, but you will not remove your beanie under any circumstances because WINTER, silly. The code is steadfast in its loyalty to the seasons, and consequently nonchalant when it comes to comfort. It actually says in the lyrics of the national anthem, “We are free, we are proud, we win wars, we disapprove of flip-flops and forsake all other comfortable footwear, excepting velvet ballet flats with little bows.” For the rest of us, resistance is futile and renders us vulnerable to the poorly disguised wrath of Parisians everywhere - wrath being a snobbish look, a nose in the air, and more than a whiff of pity. Imagine you are waiting for a bus. “Pray-tell Madame, WHY, in the middle of winter are you NOT wearing gloves, a warm hat and an over-sized scarf-blanket? Are you mental?” incredulous eyes appear to ask. “Because Madame, it’s a warm and sunny 19 degrees today,” you silently protest, staring at the ground, flustered yet defiant. “But spring doesn’t start until the stroke of midnight on the vernal equinox!” her indignant eyes retort. She tries very hard to muster some pity for the clueless foreigner and fails miserably (much as an Australian would if met with someone who can’t swim or is allergic to beer). “Exactly,” she fumes, vindicated, as Bus 53 chugs around the corner. Anyhoo, here is my interpretation of the Paris spring fashion code. It’s not word for word since it’s purely observational and I haven’t yet learned the national anthem in its entirety. Please forgive any inadvertent omissions. 2). Stuff your ginormous black doudoune (wearable doona coat thing that you wore every single day of winter) as far as you can into the corners of your cupboard. Hide it well enough that, by next winter, you’ve conveniently forgotten about it and must buy the updated version of the same one. 3). Into your cupboard-of-lesser-used-things, hang NEATLY your navy buttoned peacoat, long belted wrap coat and your collection of heirloom furs. You’ll be needing those for many winters to come. 4). Click the heels of your chunky black lace up boots 3 times and say ‘there’s nothing like spring, there’s nothing like spring, there’s nothing like spring.’ Take them off and put on your extremely white Adidas Stan Smiths* (see below for more info on trainers). Black boots, by Bocage (I personally have a pair of these). 5). Place your Limousin-sourced lambskin gloves, wool-blend hats and cashmere scarves somewhere, anywhere out of sight. 6). Remove all burgundy, dark grey, navy and most black clothing. Replace with officially approved springtime yellows, sea-greens and blue hues. 7). Purchase at least one new-season cotton or silk scarf according to the latest colour trends identified during Paris Spring Fashion Week. This year's colours are (were) candy pink and sunshine yellow (below, as per vogue.fr). 8). Patterned garments with muted tones or muted patterns with louder tones should reflect a combination of la mode along with the unique ‘character’ of the wearer. 9). Earrings are required to dangle a little lower in spring. 10). Red lipstick is to be swapped for pink. 11). Ditto red wine for rosé. 12). Jeans may be worn but must bare ankles (cropped, rolled or cut). 13). Socks may be worn but not visible (sockettes). 14). Only lightly impermeable trench coats (classic cut) are allowed on rainy spring days. Fully waterproof raincoats are not recommended as they negate the need to purchase a nouvelle collection umbrella from Monoprix. 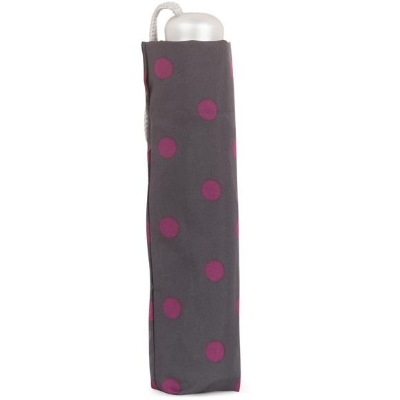 Umbrella from Monoprix. Spots are hot. 15). Transfer items from your winter carry-all IT bag to your summer carry-all IT bag. For casual outings in your quartier, a lighter cross-body IT bag is allowed. It will communicate to all your light and happy spring-time feels. Note: your ‘going out IT bag’ is none of these. Going out IT bags are preferably high-end fashion labels such as Chanel, YSL, Celine or Chloe. Less pricey but still pricey options are Maje, Marc Jacobs, Michael Kors and APC. Colour preference for night time = black. Maje bag: frills are a thing. 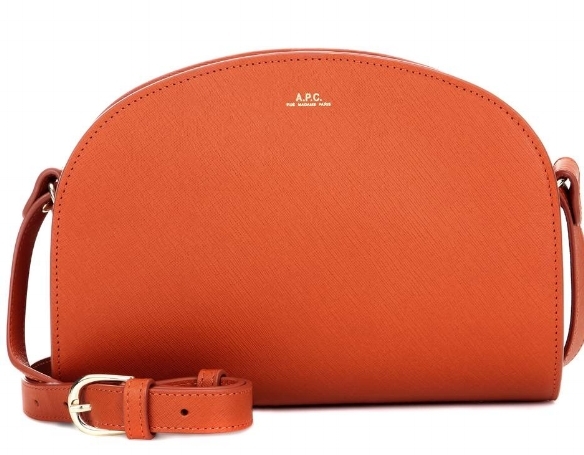 The APC 'half-moon' bag has a cult following. Grained leather is a pleasure . This one from mytheresa.com. YSL. Everybody needs a little black bag. * Further notes on trainers: All trainers must be extremely white. Any evidence of dirt will expose you as a fashion slacker who has let themselves go. If you insist on going against the Stan Smith or Superstar grain, brands like Supergra, New Balance and Converse are accepted. Personally, when it comes to trainers, I like Converse because they have no trendy trimmings that belie the year they were bought. I don’t bother keeping them extremely white because these are French rules, and whilst I strive to avoid those ‘say it all silently’ conversations on the metro and where-have-you, I am, at the end of the day not French. Additionally, my visa didn’t come with a memo on how to keep shoes perfectly white whilst wading knee-deep in grime, pigeon poo and many other types of poo each day. Finally, I’d like to share with you a few French labels I’ve come to admire since living here. I say admire because often I’m doing exactly that - touching, smelling, trying on, doing a twirl and then putting it right back on the hanger. "Je vais réfléchir à cela" (I’ll think about it), I say sheepishly and make my escape. Sessun: For pretty cuts and quality fabrics. Pablo: I like their warm winter coats with a unique edge. Comptoir des Cotonniers: This is not the most imaginative brand, but I have bought some great summer dresses here. I've heard it's THE place to buy a quality classic trench. Maje: Popular French label with seasonal must haves. Leon and Harper: Smart casual wardrobe wants. I saw a green leather jacket in there once that I still think about, 3 months later. Belair: I don’t love all of it, but this label has versatile winter coats and bold dresses. Harris Wilson: Pretty patterned shirts, merino v-necks and slouchy cardigans. Belzac: Comfy casual with class. There are other stores that are so luxurious I daren’t go in. You know the ones, with security and queuing ropes out the front. This is when I exercise my right to use the famous French phrase for window shopping, “lécher les vitrines”. Translated literally it means to lick the windows. Can you imagine a polished French lady licking windows? It makes me think of Willy Wonka and the Chocolate Factory when the kids were hungrily licking snozzberry flavoured wall-paper. Delicious! Now it's your turn! What are your favourite French brands? How do you keep your trainers blindingly white (tell me, is it spray paint, Shayna Blaze style)? What is missing from my interpretation of the everyday French fashion code? Educate me, please and comment below.